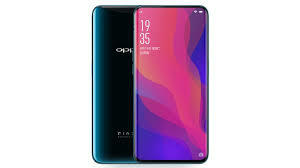 BBK-owned chinese manufacturer’s latest flagship smartphone Oppo Find X has been launched in India and with this the company is planning to boost the sales. Oppo Find X price in India has been set at Rs. 59,990 for the 8GB of RAM and 256GB inbuilt storage variant. Oppo’s Find X will be available from and the company has revealed its price details for India as well. It was initially announced in June 2018.
dual-SIM (Nano) Oppo Find X runs ColorOS 5.1 based on top of Android 8.1 Oreo out-of-the-box. It features a 6.42-inch full-HD+ (1080×2340 pixels) AMOLED panel with a 19.5:9 aspect ratio, screen-to-body ratio of 93.8 percent, brightness of 430 nits, and pixel density of 401ppi. The handset is powered by the flagship 64-bit, octa-core Qualcomm Snapdragon 845 SoC, which comes paired with an Adreno 630 GPU and 8GB of RAM.